Matthew Craddock was the son of Richard ap Gwilliam ap Evan ap Craddock Vreichfras and Jennet Horton of Candleston Castle in Glamorgan. His great grandfather, William Horton of Tregwynt in Pembrokeshire, married Joan de Canteloupe the heiress of Candleston. Jennet Horton was their granddaughter. I first came across Matthew Craddock while looking at anything that connected Bishop Stillington to Mathry in Pembrokeshire and his connection to the Craddock/ Newton family of East Harptree in Somerset. Some of the Craddock family (Caradog in Welsh) had changed their name to Newton however Matthew’s father retained the name Craddock. William Horton was from Tregwynt in the Parish of Granston and the living is annexed to that of Mathry which was where Stillington was living at one time .There are connections between Stillington and Sir John Newton of East Harptree whose father was a Sir Richard CraddockNewton. Sir Richard Craddock Newton was the arbitrator for the Talbots in the Berkley dispute. It was thought that Matthew and Sir John may have been brothers but this is thought to be unlikely now. It is possible that they are related but not brothers. When discussing Sir William Herbert on the Richard III Forum and the fact that he was in charge of guarding the South Wales coast for his father in law Richard III in 1485 it occurred to me that the Glamorgan Castles could have been part of this defence and that maybe Matthew had supported Richard. In the Dictionary of Welsh Biography it is reported that the Calendar of Patent Rolls 6/3/1485 – 1486 1HVII says that Craddock was appointed Constable for life at Caerphilly and Kenfig Castles. In 1491 Sir Matthew Craddock was appointed Steward of the Gower and also in 1497. Then I read a short note on a genealogy site, though obviously genealogy sites are not a reliable sources, it said that Matthew Craddock had fought in Rhys ap Thomas’retinue at Bosworth, this came as a surprise and a disappointment though it would probably explain the appointments under Tudor. Apparently William Herbert didn’t fight at all at Bosworth, which begs the question was it because he had links to Tudor from childhood (Tudor was brought up by the Herberts as their ward) or had Richard excused him to look after Katherine in the event of a Tudor victory? I had started looking at the families who lived in some of the castles along the Glamorgan and South Wales coast before I came across the information that possibly Craddock had fought in Rhys ap Thomas’ retinue. Some of the names were familiar to me as there were still some of their descendants living in Glamorgan at least until the 1960s.These families were the Stradlings, the Turbevilles, the Mansells and the Talbots. Candelston Castle is on the west side of the River Ogmore on the opposite side to Ogmore Castle. All along the Glamorgan coast there are castles, to the east of Ogmore is St Donat’s Castle, seat of the Stradling family and to the west would have been Kenfig castle. Further inland from Ogmore are Newcastle Castle, guarding the approach to the Llynfi Valley, and Coity Castle, seat of the Turbeville family. The Turbevilles also inherited Newcastle when one of them married the daughter of Morgan Gam of Afan. When the Normans took over South Wales they built castles at Ogmore, Newcastle and Coity. Ogmore Castle was an important link in the defensive system of the Ogmore estuary. They were known as the Ogmore Triangle. Apparently they had a system whereby they would come to one anothers aid if attacked. Ogmore is on the estuary of the river and would guard against invasion from the sea. Further north is Newcastle, in what is now Bridgend, it is built high on a hill overlooking the river and so protecting the access to the Llynfi Valley. Coity is slightly north west of Newcastle and protects the Ogmore and Garw Valleys. Ogmore, Newcastle and Coity were built by William de Londres in the 12th century and Coity was granted to Payn de Turbeville by Robert Fitzhamon. Payn Turbeville’s gt grandson Gilbert Turbeville married Matilda daughter of Morgan Gam of Afan and in 1217 he acquired the manor of Newcastle previously held by Morgan Gam and from then on Coity and Newcastle devolved together. The Turbevilles held both properties until 1380 when Richard Turbeville, a descendant of Payn Turbeville, died without issue and the properties descended to his sister Catherine and her husband Sir Roger Berkerolles. Their daughter Gwenllian Berkerolles married Sir Edward Stradling of St Donats. Imagine my surprise when, not long after I had read that Matthew Craddock had fought in Rhys ap Thomas’ retinue at Bosworth, I read in the Dictionary of Welsh Biography that Jane Stradling’s second husband was none other than Sir Rhys ap Thomas. Thomas then became guardian to the young heir, Edward Stradling. Jane died in 1485 presumably leaving young Edward in Rhys’ care. There was a suggestion that Rhys took the money from the St Donat’s estates for three years in a row. This explained to a certain extent the connection between Matthew Craddock and Rhys ap Thomas as Candleston Castle, like Ogmore Castle, is only a few miles west along the coast from St Donat’s. Matthew Craddock would have only been about seventeen in 1485, as it is thought that he was born in 1468, however, it is also thought that he might have been born as early as 1458. He would have been old enough to fight at Bosworth. After Bosworth he began a rapid rise being appointed Constable for life of Caerphilly and Kenfig Castles and Steward of Glamorgan in 1491 and 1497. He married Alice Mansell daughter of Sir Philip Mansell of Oxwich Castle, on the coast west of Swansea. I believe there doesn’t appear to be a record of the date, though some sources give 1489 as their date of marriage. They also report that his wife’s name could have been Jane Mansell. There doesn’t appear to be a complete set of facts about Craddock’s life. However, Matthew and Alice/ Jane’s daughter Margaret married Sir Richard Herbert the illegitimate half brother of William and Walter Herbert. There are obviously connections through marriage between all these families. So were they Yorkist or were they Lancastrian, or were they doing a Stanley and supporting whoever was in power to get the best deal for their family? I doubt if we will ever know. In the Inventory of Ancient Monuments of Glamorgan, it is reported that Warwick was Lord of Glamorgan and that Clarence claimed it in 1474, however, it was awarded to Anne’s share and Richard became Lord of Glamorgan. It is reported that he raised the salaries of the officials of the Lordship to stop them extorting ancient dues from tenants, so he may not have been unpopular in Glamorgan. After Bosworth, Jasper Tudor was the Lord of Glamorgan. In 1517 Sir Matthew Craddock married Lady Catherine Gordon, wife of “Perkin Warbeck”. Lady Catherine had been taken into the household of Elizabeth of York after” Perkin’s” arrest and had been treated well by Henry Tudor, however, he had never allowed her to leave court. Some sources report that he kept her a prisoner though he did treat her well. After Henry Tudor’s death Henry VIII gave her property in Berkshire in return for her promise not to leave England. When she married Craddock she was, however, allowed to live in Wales with him. Though it is also reported that they spent their married life at Court, because Lady Catherine was head of Princess Mary’s privy chamber. There are various stories that Lady Katherine and “Perkin Warbeck” had a son and that he was brought up in Reynoldston on the Gower Peninsular. There is a story that a family named Perkins are descended from him. There is no evidence to prove that Katherine and “Perkin “ had a son, however, it has always seemed odd to me that she had agreed not to leave England and yet she ends up marrying the man who had been the Steward of the Gower and also lived there. I just wondered if she went to spend time with her son. 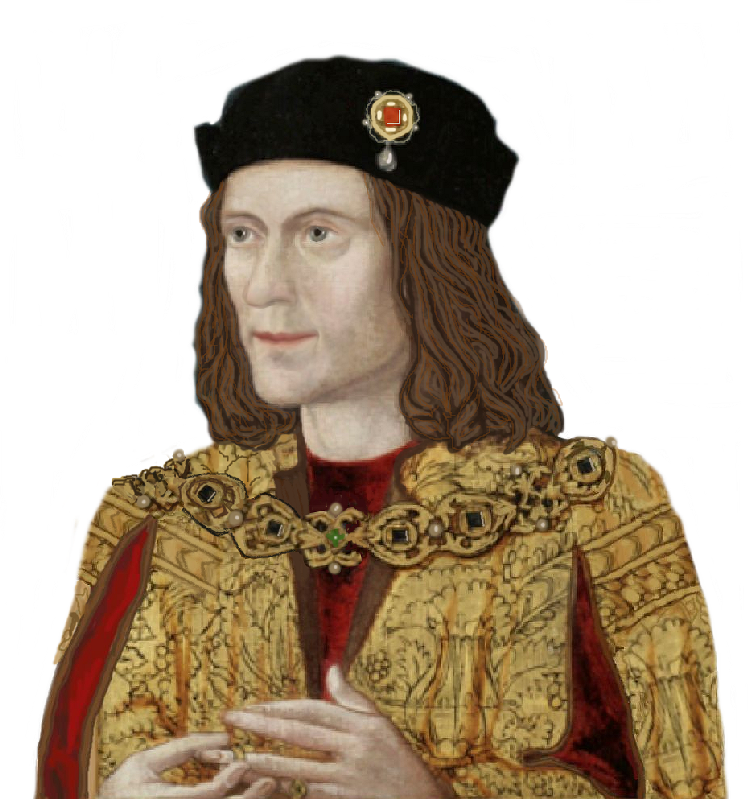 Unfortunately my idea that Sir Matthew Craddock was a supporter of Richard III came to nothing, however, it led to discovering connections between the families who controlled the coast of Glamorgan and maybe helping to explain how they flourished under the Tudors. In my opinion they probably would have fared just as well had Richard won Bosworth, indeed they might have fared better. Coity and Candleston Castle videos: h/t Stefen Felix. The last few times I’ve gone to visit the other half’s family in Somerset, we’ve driven through the town of Langport, a small place now but once an actual port and quite an important site in the Middle Ages. As we rounded the corner in the car, I kind of obliquely wondered why there was a great big portcullis painted on a wall, standing out with stark menace against the whitewash . Or why the local pub was also called ‘The Portcullis’ and had a sign depicting the same emblem. And then the penny dropped…there might be an association with Margaret Beaufort, Henry Tudor’s mother. I should have guessed already; on an earlier trip to nearby Taunton, I had noticed a stained glass window dedicated to her wily servant, Reginald Bray, in one of the churches and thought there had to be a local connection. As it happens, Margaret Beaufort, owned the manors of both Langport and Curry Rivel. Forget the modern portcullis emblems on wall and pub sign–original late 15th carvings of the Beaufort portcullis appear on the towers of both All Saints Church in Langport and St Andrews in Currey Rivel. Going into the nave of the church, there was a Norman door remaining from an earlier church on the site…and on one wall, a rather flattering framed portrait of Margaret Beaufort ( not the usual one we are used to seeing, one in which she looks much younger). There is also some fine 15th c glass depicting several saints, possibly the finest medieval glass in Somerset. But it was the hunky punks that intrigued me most, so it was back outside the building to look around the rear of the church…especially since I’d had a ‘tip off’ that two of the carvings were not the usual gurning goblins that danced sinisterly along the Somerset church rooflines. Tucked out of the way, near a window, I spotted two hunky punks that didn’t quite match the mouth-pullers, wide-grinners, and tongue-pokers all over the rest of the church. Do these two hunky punks look vaguely familiar to you? Is this a new Richard film? Or not…..? Before you examine the above links, let me say that the following tale of woe demonstrates the hazards of taking a press article at face value. Beware of doing so, for it can lead you up the garden path. . .
Men with long hair but no tattoos are needed as extras for new Hollywood film to be filmed in Wells, Somerset. The Casting Collective has put out an appeal male and female extras to appear in what they describe as a “Major Hollywood Feature Film”. It is unclear at this stage what the film will be called or who will be starring in it. According to the company’s website the extras will need to be available for a costume fitting around the week commencing Monday, July 6 and one filming day around Thursday, July 16. Men ideally need to have some length to their hair, and facial hair is sought but it is not essential. Women wishing to take part as an extra need to have natural chin length hair or longer. Extras must not have any visible tattoos, for example on the face or hands. Right, the next thing to point out is that the whole of this follows beneath the picture at the top of this page, i.e. 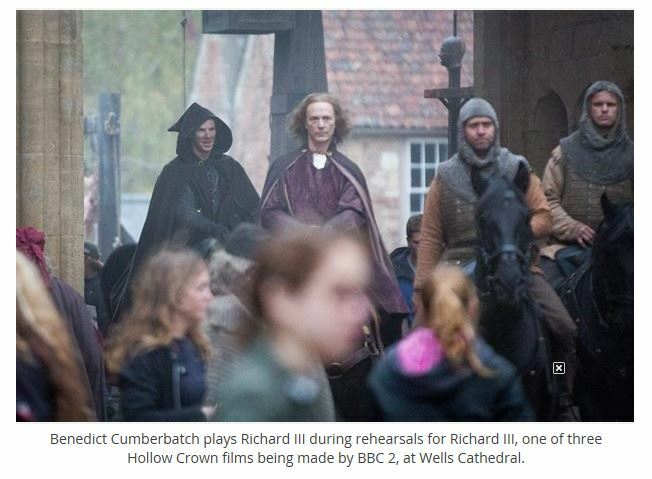 of Benedict Cumberbatch as Richard III in the forthcoming “Hollow Crown” series on BBC2. The inference, it seemed to me, was that the ‘major Hollywood feature film’ being filmed in Wells was perhaps about Richard III. All bells and whistles, and Hollywood pzaz! Wow! Well, that was my initial impression. Oh, goody, thought I. A new film about Richard. However, on reading it again, for all the inclusion of the picture of Benedict Cumberbatch as Richard, there isn’t actually a connection between the BBC production and this mysterious new, unnamed movie. Unless you count filming in Wells. The requirements for the extras suggest a historical story of some sort, but still does not actually mention Richard at all. Finally, after more Googling, I found this utter deflater: http://www.westerndailypress.co.uk/…/story…/story.html It’s only a prequel to “Snow White and the Huntsman”! So, not even the Monmouth Rebellion (when Wells Cathedral was looted for ammunition and the battle of Sedgemoor took place on 6 July) What a let down to this hopeful Ricardian. Thus fizzled out my brief but dazzling excursion into the realms of fantasy. But there will be a really good film about Richard. One day. I just know it! 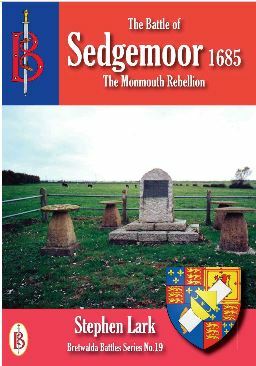 Stephen Lark’s book on the Battle of Sedgemoor…. Driving the M5 today, across the Somerset Levels, it is hard to imagine what the landscape used to be like, before rhynes and ditches drained much of the water. The rhynes were there in the 17th century, but they were nowhere near as efficient as they are now, and there were still wooden ‘paths’ among the reeds on the marshes. Folk used boats and skiffs a great deal, especially where the deeply channelled marshes had not surrendered to man’s attempts to drain them. Even now, only a year or so ago, the Levels were under water for a long period. Television reporting showed film after film of the terrible scenes of prolonged flooding, and what the local people had to suffer. So imagine having to fight a pitched battle in such surroundings. Having to not only strike down your bitter enemies, but save yourself from drowning as well. James, 1st Duke of Monmouth, was the illegitimate (some say legitimate) son of Charles II, at whose death, the king’s brother, James II ascended the throne. James II was a Catholic in a Protestant land, and there was great resentment in a number of quarters. Monmouth—young, handsome, popular— raised a rebellion against him. After skirmishes, the two armies finally confronted each other on Sedgemoor. The conflict started in earnest on 6th July 1685. It all went wrong for Monmouth, who fled but was finally caught. He was executed on 15th July on Tower Hill, requiring a number of blows from the infamous executioner Jack Ketch to sever his head. Ketch often botched his task, so poor Monmouth suffered at his hands. The irony of it all is that three years later, on 30th June 1688, James II was deposed in the Glorious Revolution. Perhaps, if Monmouth had waited, his claim might have been accepted. We will never know, of course, because history unfolds and there is no folding it back again and putting it in another drawer. This book by Stephen Lark is, as always with him, exceeding interesting and well told. If you want to know the story of Monmouth and the Battle of Sedgemoor, this is an excellent place to start. Recommended.